Good news, Leonard Cohen fans: the Canadian legend's 1972 Bird on a Wire tour documentary will finally get the DVD treatment. The 107-minute film, which contains four poems, tour footage and 17 performances, will be packaged as a DVD, alongside a limited-edition tour poster print. Bird on a Wire premiered at London's Rainbow Theater on July 5, 1974, two years after its scheduled release in late 1972. 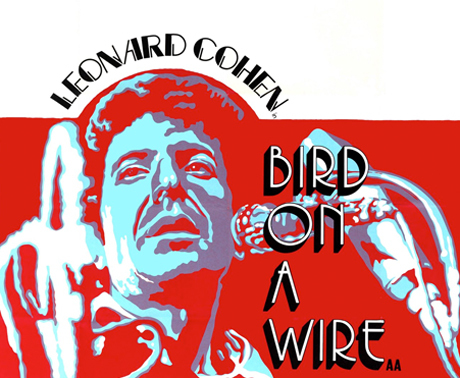 According to Cohen biographer Ira Nadel and the Leonard Cohen Files website, Cohen was unsatisfied with the original version and hired an editor to spend nine months re-editing the film. While the BBC initially expressed interest in broadcasting the film, the British broadcaster turned down the edited version, according to filmmaker Tony Palmer . The film mysteriously disappeared after its 1974 release. In 2009, more than 290 cans of film were discovered in a Hollywood warehouse. Frank Zappa's manager shipped the film cans to Palmer, who used digital means to reconstruct the documentary, piece by piece. "It has been a joy - although an exceedingly expensive one - to slowly but surely restore the original film," Palmer writes in his blog. "My admiration for Leonard's music and the group of highly skilled musicians who accompanied him on that European tour has again been rekindled. Above all, my love for the man: a good man and a great songwriter." Bird on a Wire is due out on September 14 in Canada.